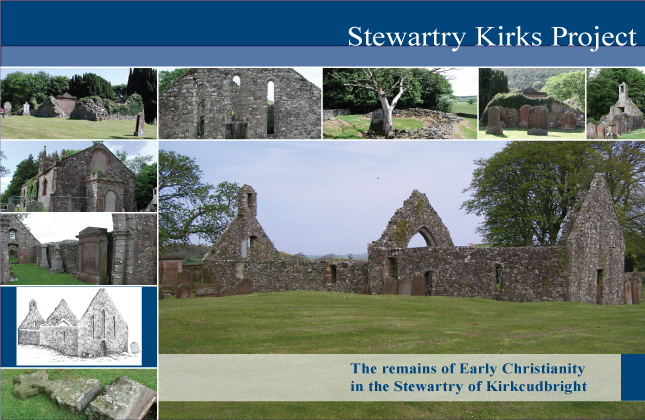 This Project has been established to record and re-evaluate early Christianity within the Stewartry of Kirkcudbright. The project aims to provide an record of the upstanding remains of all pre 1800 unroofed churches through standing building surveys, photographic surveys and the gathering of historical information from available sources. Since 2002 work has been carried out on the remains of Buittle Old Kirk, Kirkcormack, Southwick Old Kirk and Tongland Abbey. We are also working on shortening the list of sites and visiting each parish in turn, carrying out photographic surveys on a regular basis. The first Interim Report coving these four sites is now available, and is available direct from the project via the contacts page for £3.50 including postage and packaging. This web site aims to provide a full record of each church site, mainly through the photographic record and short notes on each site. Selected digitised drawings of each site will also be published on the web site. We are presently engaged in the historical research for a number of sites with Standing Building Surveys also under way. Please select a church site from the Research index to investigate further. [Only sites with a hyperlink have been looked at. The others will follow as the investigations continue]. Pilgrimage Spots in Galloway, E. M. H. McKerlie, London 1916. Transactions of the Dumfriesshire & Galloway Natural History & Antiquarian Society. All images, photographs and text are the copyright of Stephen Clancy, unless otherwise stated, and should not be reproduced in any form without prior permission from Stephen Clancy. Publication here of site names and Ordnance Survey Grid references does not mean that the sites are open to the public. The majority of sites are on private land and permission should be sought before visiting sites. Where sites are within the confines of church yards or are cemetery's they are generally open to visitors, though due care and attention should be paid as cemetery's are dangerous. This project will not accept any responsibility for accidents while visiting listed sites. 2018 The Urban Historian | Newspaper Lite by Mirrorgrid Store.